A great idea from neoHouston: to limit land speculation that jacks up prices and prevents development near rail lines, raise appraisals - and therefore property taxes - to match asking prices. He gives an example of a $5m appraised property selling (or, to be more accurate, not selling) for $15m. Raise the appraisal and the taxes, and they will lower their asking prices and have an incentive to sell or develop sooner. My own idea: should we consider modestly higher property tax rates on undeveloped or idle properties to encourage getting them to a productive use sooner rather than later? Joel Kotkin on "The Blue-State Meltdown and the Collapse of the Chicago Model"(i.e. patronage, machine politics, corruption). Despite blue state control of the federal government, they are also suffering the most in this recession. What does that say about their high tax, high regulation, pro-union model? Houston ranked as a top 10 zoo for kids. Hat tip to HAIF. "Mauro Ferrari is on a mission to make Houston a major hub for nanomedicine. Housed at the University of Texas Health Science Center, Ferrari's lab will become the Department of Nanomedicine and Biomedical Engineering in September. According to Ferrari, it will be the first nanomedicine department at a US medical school. The nanomedicine professor, whose team is developing nanosized diagnostic devices to treat cancer and cardiovascular disease, is in an enviable position, especially given the current economic climate. Ferrari plans to recruit another 30 researchers to complete his 100-member academic research team, and he has co-founded two companies. NanoMedical Systems, in Austin, Texas, is developing a nanomaterial-based drug-delivery system, and Leonardo Biosystems in Houston is researching nanotechnology-based cancer therapeutics. Houston is already well known for its prowess in the nanoscopic field. The city was home to the 1985 discovery of spherical carbon-based fullerenes known as 'buckyballs'. That work was later awarded the 1996 Nobel Prize in Chemistry. Yet so far, nanotech advances have been more incremental than monumental. This could be set to change as research funds start to flow, nanomedicines head to clinical trials and entrepreneurial academics aim to incorporate nanomedicine into mainstream medical care." A discussion panel video on Houston regional transit, including transit guru Christof Spieler. "Hi, my name is Aaron Carpenter and next Thursday (8/6/09) I will be moderating a discussion at Cite Magazine's blog, Offcite.org, entitled "The Astrodome --- What Can Be Done?." We are hoping to have a serious and thoughtful, yet lively dialogue about the future of the Astrodome. Former Chronicle reporter Madeleine Hamm and UH Professor of Architecture Bruce Webb will open the comments. This post will OffCite's first post open to comments. If you could help us get the word out, or comment yourself, it would be greatly appreciated. We hope it will be a constructive, open-minded discussion and the more people we can get involved, the better." I have 12 items, but this post is pretty long after only 6, so we'll save the rest for next week. Have a great weekend. ...benchmarking D-FW against major metropolitan regions worldwide in key areas for global competitiveness: talent, access, resources, business climate and quality of life. The 20 metropolitan regions used to benchmark D-FW represent an elite stratum of global business centers, selected on the basis of their national significance, world rankings in advanced services, airport activity, ability to attract talent and ties to D-FW. They are located in Asia, Australia, Europe, North and South America, and they include long-established leaders such as New York, London and Tokyo, as well as newly emerging regions such as Mumbai and Monterrey, Mexico. Five essential ingredients for economic success were identified based largely on executive surveys of international location decisions: the availability of skilled workers, access to markets and partners, local resources to support business operations, a favorable business climate and quality of life. A total of 27 indicators were collected for all 21 metro regions, including D-FW. Overall, D-FW ranks 10th in global competitiveness among these 21 elite global business centers. This ranking reflects a composite measure of all 27 indicators in the five major categories. Houston, the only other Texas city in the study, ties with Dallas in this composite ranking. Business climate is D-FW’s strongest asset. The very low costs of doing business here combined with the nation’s relatively stable institutions and competitive taxes boost D-FW to second place in business climate, tied with Atlanta and outpaced only by Singapore. D-FW also performs exceptionally well in the international arena on quality of life, ranking 8th in a four-way tie with Amsterdam, Chicago and Houston. Quality of life indicators focus on health, safety and affordability. Resources measure a region’s capacity to create, implement and sustain leading world-class operations as measured by the presence of top headquarter operations and stock exchanges as well as research, development and patent activity. D-FW and Houston stand together in 10th place on these indicators. Atlanta and Chicago (and Houston) create a four-way tie with the Texans at 10th place in access, which measures a region’s ability to move people and goods to and through the area by air, land and water. Singapore joins D-FW and Houston with a showing of 11th place on talent, which measures both quantity and quality of the existing work force as well as capacity to train future employees. D-FW is one of only five metros in this study that does not fall below a mid-point ranking in any of the five major categories. The other four include London, Los Angeles, Chicago and Houston. The remaining 16 struggle with one or more of the essential ingredients of success. This study tells a story that is wholly consistent with the region’s domestic reputation. Dallas-Fort Worth is a formidable competitor, able to distinguish itself among an elite set of international metropolitan regions. The business climate is exceptional at the very highest levels of competition and the region shows no significant weaknesses in the five essential ingredients for economic success. Dallas-Fort Worth is well-positioned to continue its progress in the global economy. However, there is work to be done. There are individual indicators in this report that warrant further attention, especially in the areas of talent and access, and the competition ahead is fierce. Area leaders and decision-makers will need to make critical resource allocations in the coming years to ensure continued success. As always, you have to take these things with a big grain of salt. Anything based on an arbitrary weighting of an arbitrary list of variables is suspect. But it never hurts to rank higher rather than lower, and that bodes well for Houston (and DFW). The HPRA speaker this Friday is Houston blogger Tory Gattis, who will discuss his work with urban scholar Joel Kotkin and his optimistic views about Houston as a city that allows rapid social mobility for citizens "as an alternative to the popular smart growth, new urbanism, and creative class movements." More on Opportunity Urbanism here. Full-color bound copies of the report will be given to attendees. What does this mean? Most travel is not for its own sake. So reducing the total miles traveled -- whether the length or number of trips -- means people would have to reduce the activities they want and need to do. People would be "coerced," in effect, to live in less desirable places or work in less desirable jobs; shop in fewer and closer stores; see their doctor less frequently; visit fewer family members and friends. There are three likely ways this could work. The cost of travel could be increased by raising the prices of vehicles or fuel; travel time could be increased by not expanding the highway system; or superior alternatives to the private car could be developed. The most likely way to increase the cost of travel would be by increasing fuel taxes perhaps to as much as $4 per gallon, as some have suggested. Allowing congestion to increase travel times would be politically easier. In the name of "multimodal planning," for example, road-use taxes could be diverted, as Messrs. Rockefeller and Lautenberg suggest, to "increase the total usage of public transportation." But public transportation (where it's available) typically takes twice as long as automobile travel, so it's not practical for many Americans. Moreover, public transportation (passenger rail services, subways, buses, light rail) requires heavy subsidies, while roads mostly pay for themselves through fuel taxes. Our roads would be even more self-sustaining if 20% of the federal fuel tax were not already diverted to public transit from the federal Highway Trust Fund. Messrs. Rockefeller, Lautenberg and Oberstar want to grab even more money from the trust fund. Americans have always valued their independence and mobility. One way to reassert their rights would be to abolish the misnamed Highway Trust Fund, which finances highway construction and maintenance. Let the states decide what roads they need and how to finance them. The present system expires on Sept. 30 unless Congress reauthorizes it. Let it die. If a significant number of states opted out of the federal system, it would collapse and responsibility for roads would revert to the states. The vast majority of road users would benefit from such a change. And, if "livability" standards were deemed desirable, local preferences would determine them, rather than federal "greenhouse gas emissions reduction goals." As I've said many times before, I am a life-long rail fan who has ridden trains on four continents. As a transportation professional, however, it's incumbent on me to advocate meeting transportation needs in cost-effective ways. Before we spent tens of billions of taxpayer dollars on inter-city passenger rail, I think it behooves us to take a closer look at the potential of inter-city bus travel. Besides considerably lower fares than Amtrak, much wider geographic coverage, and a much smaller carbon footprint, inter-city bus service has something else going for it: negligible cost to taxpayers. The Nathan study puts the federal subsidy per passenger mile (averaged over the 10 years from 1996 to 2005) at 0.1 cents. Amtrak's figure is 19.2 cents. Those numbers are consistent with federal subsidy figures in the 2005 U.S. DOT Bureau of Transportation Statistics report "Federal Subsidies to Passenger Transportation." He even mentioned some of the luxury bus services with wifi popping up around the country - especially in the northeast - that appeal to a different demographic from Greyhound. How come we can't get one of those for the Texas Triangle? Shareef has assembled a page of top Houston rankings from the last few years, which I have also added to my permanent right-side blogroll links. It's a pretty amazing list. Animated map of job growth and loss over the last few years. Note the sudden big red Katrina blob over NOLA, and Houston holds out as the last green dot. Hat tip to HAIF. Speaking of jobs, Houston ranks well on professional job gains. In sheer numbers, we're 2nd-best since 2000, after only the greater DC area (be afraid for your future federal tax bill). Chris describes how zoning has spun out of control in Austin, and that drew interesting commentary from an infill developer. Let's take a moment to be thankful we don't have this level of red tape in Houston. Another from Chris: a good defense of toll roads vs. free. And one more from Chris: Census gains for the top 25 cities, with Houston still showing strong growth both for one year and the whole decade. Houston and Atlanta will climb into the top six. Houston was the nation’s seventh-largest metro in 2005, and Atlanta was No. 9. Both will be moving higher in coming years. Houston is projected to shoot up to fifth place by 2025, adding almost 2.6 million people to reach a population of nearly 7.9 million. Atlanta is ticketed for sixth place at 7.3 million. The top four metros, by the way, will maintain precisely the same order over the 20-year period: New York, Los Angeles, Chicago and Dallas-Fort Worth. Hat tip to Neal and Jessie. Houston ranked as the fourth-best city for NBA free agents. And the ranking is based on not just the Rockets, but other aspects of the city as well. Not bad at all considering the competition. Hat tip to Jessie. NYT coverage of the hip night scene in Houston on Washington Street. Hat tip to HAIF. "Of the top 25 destinations for domestic migrants between July 2006 and July 2007, before the recession started, Census data show only four drew more people in the subsequent 12 months, between July 2007 and July 2008, when the U.S. was in recession, according to an analysis by Mr. Frey. The four places: Portland, Seattle, Denver, and Houston, which in addition to attracting college graduates, enjoyed a boom fueled by high oil prices." Finally, Harris County Judge Ed Emmett recently sparked some discussion about whether unincorporated northwest Harris County should become its own city. We're talking about several hundred thousand people here, so not an insubstantial city. But I'd rather see it annexed into the City of Houston (which does have annexation rights over it) if it would be financially good - or at least neutral - for the city. It would go a long way toward helping us eventually pass Chicago and LA for the country's #2 city. Also, if Houston annexed enough of the unincorporated county, we might be able to eliminate a lot of city-county duplication of services. But I'd be interested to hear your thoughts in the comments. 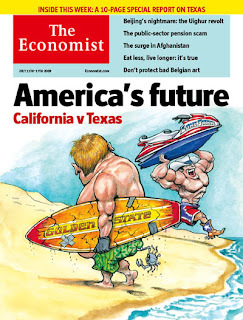 The Economist magazine has a 10-page special report on Texas this week (pdf), only the second state they've ever covered in such detail (after CA). In fact, the cover and lead op-ed is about CA vs. TX. Indeed, high taxes, coupled with intrusive regulation of business and greenery taken to silly extremes, have gradually strangled what was once America’s most dynamic state economy. Chief Executive magazine, to take just one example, has ranked California the very worst state to do business in for each of the past four years. By contrast, Texas was the best state in that poll. It has coped well with the recession, with an unemployment rate two points below the national average and one of the lowest rates of housing repossession. In part this is because Texan banks, hard hit in the last property bust, did not overexpand this time. But as our special report this week explains, Texas also clearly offers a different model, based on small government. It has no state capital-gains or income tax, and a business-friendly and immigrant-tolerant attitude. It is home to more Fortune 500 companies than any other state—64 compared with California’s 51 and New York’s 56. And as happens to fashionable places, some erstwhile weaknesses now seem strengths (flat, ugly countryside makes it easier for Dallas-Fort Worth to expand than mountain-and-sea-locked LA), while old conservative stereotypes are being questioned: two leading contenders to be Houston’s next mayor are a black man and a white lesbian. Texas also gets on better with Mexico than California does. It also gets into some of our weaknesses: primary education, health care for the poor, and Tier 1 research universities - also repeated in the special report. The good news is that the Tier 1 problem got addressed in the last legislature, Obama is tackling health care at a federal level (where it belongs), and they have an article on the education solution: a profile of the KIPP and YES charter schools that started in Houston, and have a 90+% success rate getting poor and disadvantaged students into college. Why aren't we just handing over the failing urban schools to these guys? Housing repossessions are still very rare; the state budget is still in surplus even as California and New York teeter on the edge of bankruptcy. Unlike those fellow states with large populations, Texas levies no personal income tax, and with almost unlimited space on which to build, its houses are big and affordable. All this has brought people flooding in and made Texas America’s fastest-growing state. Net domestic inflows have been running at around 150,000 people in recent years, whereas California and New York have seen net outflows. Next year’s national census is expected to show that flourishing Houston has replaced struggling Chicago as America’s third city (an unfortunate error by TE, as we are expected pass the Philadelphia metro in 2010, but it could be decades before we pass Chicago as either a city or metro - see here). Of the ten largest cities in America, three are in Texas. Those three, Houston, Dallas and San Antonio, together with the state capital, Austin, and Fort Worth, make up what the boosters call the Texaplex: a densely packed triangle, with each side measuring about 300 miles, that is home to roughly 80% of the state’s population of 24m (second only to California’s 37m). This “Texas triangle”, containing America’s third-largest airport (Dallas-Fort Worth) and its second-busiest port (Houston, despite being 50 miles inland), has emerged as one of the most dynamic regions in all of America. Joel Kotkin, an urbanologist based in California, recently compiled a list for Forbes magazine of the best cities for job creation over the past decade. Among those with more than 450,000 jobs, the top five spots went to the five main Texaplex cities—and the winner of the small-cities category was Odessa, Texas. A study by the Brookings Institution in June came up with very similar results. Mr Kotkin particularly admires Houston, which he calls a perfect example of an “opportunity city”—a place with lots of jobs, lots of cheap housing and a welcoming attitude to newcomers. ...Texas’s biggest advantage: its sheer size. Larger in area than any country in the European Union and than any American state bar Alaska, Texas has huge amounts of space into which its cities can expand. This has allowed Houston to sprawl over some 600 square miles; it is probably the most spread-out big city in America and has no zoning restrictions, allowing the market to determine the best balance between retail, commercial and residential uses. I'm going to take an issue with "the most spread-out big city in America", as this table shows that 4 of the 10 largest cities in America have lower densities than we do. And if you look at metro areas, Atlanta (among others) is substantially less dense and more sprawling than we are. So Texas has a huge challenge to cope with. But it seems wrong to end on a pessimistic note. Texans above all are optimists, and few of them seem to doubt that Mexico’s proximity is a huge long-term source of strength for the Lone Star state. That optimism, rooted in a profound sense of local pride that can sometimes jar with outsiders, is Texas’s dominant characteristic. It is the reason why the wildcatter, the independent oilman whose test drillings might come up dry 20 times before gushing in the end, is an enduring Texas symbol. And it explains why risk-taking is admired and failure no disgrace. Most of the Enron executives who lost their jobs when the firm went bust in 2001 quickly found new ones. The company’s offices in Houston were swiftly re-let. Enron Field baseball stadium became Minute Maid Park. “Don’t mess with Texas” was once a slogan for a wildly successful anti-litter campaign. It is now the state’s unofficial motto. To visit America in the midst of the worst recession for decades can be a disheartening experience, but a tour of Texas is quite the reverse. Since suffering that big shock in the 1980s, it has become a well-diversified, fiscally sensible state; one where the great racial realignment that will affect all of America is already far advanced; and one whose politics is gradually finding the centre. It welcomes and assimilates all new arrivals. No wonder so many people are making a beeline for it. The NY Times had an interesting story yesterday about how the transportation stimulus funding is overly biased towards rural areas, which doesn't surprise me at all given the geographic nature of politics and the obvious fact that a road network will be more expensive per capita for a dispersed population than a concentrated one. We have more people inside the 610 Loop than in the entire state of Wyoming - whose road network do you think is more expensive to build and maintain? Note that we are the 5th largest GDP metro in the country, and ahead of DFW and Philly, even though they have larger populations. Atlanta and Miami have similar populations to us, but are significantly farther behind in GDP. San Francisco and Boston, which are 1 to 1.5 million smaller than us, but packed with highly productive, educated, creative class types still end up notably below us in GDP share - and Detroit, Phoenix, and Riverside with populations similar to both of them fall well below them in GDP. LA has more than twice our population, but less than twice our GDP share. Chicago has 67% more people than us, but only 41% more GDP share. We even slightly edge out NYC proportional to our populations. All in all, Houston punches above its class on GDP - lots of high wage and productive jobs. Not bad. Through both random telephone surveys and online participation, the goal is to have at least 200 respondents in each of the city's nine geographic city council districts, for a minimum of 1,800 completed questionnaires; please forward this email to others to give their feedback also. We need weigh-in by the intelligent readers of this blog who understand our city's strengths and want to preserve them, as well as put the focus on the right weaknesses we need to address - so please take a few minutes and fill it out today. It's time for the Spring 2Q09 quarterly highlights post. These posts have been chosen with a particular focus on significant ideas I'd like to see kept alive for discussion and action, and they're mainly targeted at new readers who want to get caught up with a quick overview of the Houston Strategies landscape. I also like to track what I think of as "reference posts" that sum up a particular topic or argument. Update: a pdf of the newspaper page with the artwork. As it celebrates the 40th anniversary of the Apollo moon landings, NASA may be facing its greatest challenge in history. Envisaged is a return to the moon, the establishment of a base there and a push on to Mars, all within far more severe budget and safety constraints than the Apollo program. Failure could mean the end of the organization. As former astronaut Bob Crippen pointed out recently (“The next step in space exploration,” Outlook, June 28, Page B8), the growing time gap between retirement of the space shuttle and new manned launch vehicles threatens the economic and technical base of the U.S. aerospace industry. Meanwhile, China’s space program, flush with funds, continues to rise as a competitor. Imagine what it will achieve with the same focus and funding that was lavished on the 2008 Olympics. A radical breakthrough is needed. There are well-documented problems with the existing bureaucracy, and heavy reliance on private contractor outsourcing has not been a panacea. To succeed, NASA will need an organization that can enable something like a “Moore’s Law of Space Travel” — yielding continuous reductions in the costs and risks of space travel similar to the rapid improvements we’ve seen in computer technology. At the same time, the Obama administration wants to pioneer “Government 2.0” based on modern “Web 2.0” collaboration technologies to improve both efficiency and effectiveness. It wants government to be more agile, innovative and entrepreneurial, and has hired federal information and technology officers to make this happen. What the administration needs is an agency to create a prototype of these new approaches — a “Google of government” able to transplant the Silicon Valley entrepreneurial ecosystem inside its organization to yield a continuous stream of innovations. Who better than NASA to pioneer this approach? NASA is in an absolutely unique position to prototype a 21st-century organization. Given current political and budget constraints, many may consider the mission near impossible, but NASA has a mandate for change. It is expected to be creative, innovative and future-oriented. The public expects most of government and the private sector to be safe and conservative, but people understand that NASA must take risks to achieve great things with limited resources. The rise of the open-source software movement is another example of the new, innovative organization. These very loose, voluntary associations have created massively complex applications like the Linux operating system and the Apache Web server — both now dominant applications on the Internet. The open-source movement has a principle known as Linus’ Law: “Given enough eyeballs, all bugs are shallow.” With the extreme consequences of potential “bugs” in the Moon-Mars mission model, the open-source approach may have useful applications at NASA. It could also be an effective way to work with international, academic and private-sector partners, as well as to build public engagement. To kick off NASA’s transformation, we are calling for the creation of a permanent blue-ribbon advisory commission drawing on leading private and academic experts, such as Massachusetts Institute of Technology’s Center for Coordination Science, the Management Innovation Lab (MLab), McKinsey & Co., and even Google itself. By integrating these cutting-edge organizational tools and concepts into a single prototype organization, NASA can create a successful model that can be emulated elsewhere in government and industry. This next-generation organization may be more valuable to society than all the accumulated spin-off technologies from a Moon-Mars mission, perhaps even besting the greatest government spin-off to date: the Internet. Gattis, a Houstonian, blogs on Organization 2.0 as a social systems architect with OpenTeams Software. Bronk is the fellow for technology, society and public policy at Rice University’s James A. Baker III Institute for Public Policy.